CD Duplication, DVD Duplication, CD Replication UK Services » Blog Archive » What is CD Duplication? CD Duplication is simply put, a process by which information or data contained in one CD is copied to another blank CD in order to sell them or make replicas for promotional requirements. By CD duplication high quality CDs can also be produced if such is the requirement. 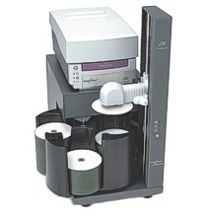 The best available machines can produce duplicated CDs of quality which can also be sold or marketed. CD duplication companies are well equipped with such machines and can produce more than 500 copies very speedily to meet all sorts of requirements and dead lines. CD duplication technology can be used for various reasons. These can produce copies of personal music or video CDs. There are many music CDs and video CDs which are not easily available in the market but are of immense value to various people. This entry was posted on Tuesday, December 9th, 2008 at 8:46 am	and is filed under CD Duplication Articles.